This entry was posted in complex responsive processes, complexity, experience, GH Mead, management, politics of everyday life and tagged complex responsive processes, complexity, Complexity and Management Conference 2016, management on January 7, 2016 by Chris Mowles. New edition published this month: the revised and updated version of Ralph’s textbook including sections on process organisation studies, new organisational examples and more up-to-date references. 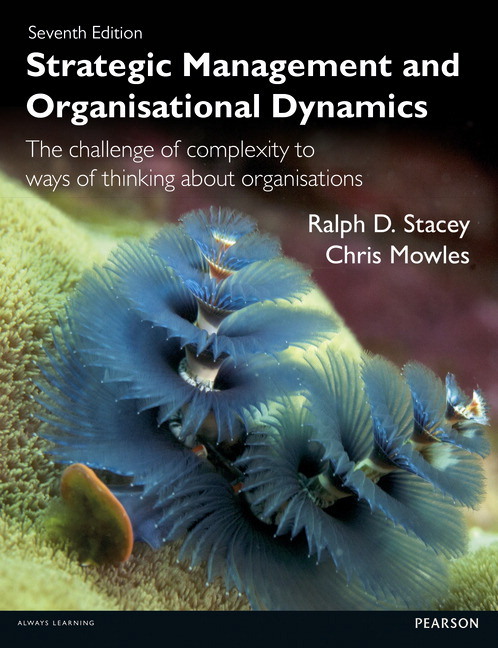 This entry was posted in complex responsive processes, complexity, critical management studies, GH Mead, management education, Ralph Stacey and tagged Chris Mowles, complex responsive processes, complexity, management, organisational dynamics, Ralph Stacey, strategy on September 23, 2015 by Chris Mowles. I address why I think there is a problem with much contemporary management theory and explain why I think it is necessary to argue against what is taken to be common sense in management. I introduce paradox and explain its roots in philosophy and point to how it manifests itself in the complexity sciences, as an alternative to some of the simplified assumptions and dualisms in much contemporary management theory. I give some examples of how paradox manifests itself in everyday organisational life. And finally I suggest some implications for managers for taking paradox seriously for what they might find themselves doing at work. I am using the title of this talk, against common sense, to make a general critique of what we might think of as the majority literature on management, but also to highlight the meaning of the word paradox, from the Greek para doxa, or against what people ordinarily hold to be true. In using the term ‘majority literature’, I am not trying to suggest that all management literature suggests the same thing, or that all business schools teach the subject uncritically (this is certainly not the case at the University of Hertfordshire and on the MBA, for example). There is a flourishing substantial minority critical tradition in management theory. This entry was posted in complex responsive processes, complexity, critical management studies, GH Mead, management, Norbert Elias, politics of everyday life, Ralph Stacey and tagged complex responsive processes, complexity, management education, management practice, paradox, scientific management on February 17, 2015 by Chris Mowles. Trust as an optimistic individual expectation, focusing on expectations that others will perform in competent and morally correct ways. Trust as an interpersonal relation, focusing on the dependence of the trustors on the trustees to respect the trustors’ interests. The relationship is one of vulnerability for the trustor. Trust as a rational decision to do with protecting one’s interests made after risk analysis or a calculation in terms of economic transactions costs (which I will not cover in this note). This entry was posted in complex responsive processes, complexity, critical management studies, GH Mead, leadership, management, Norbert Elias, politics of everyday life, power and tagged habitus, leadership, mistrust, organizational stupidity, social structure, trust on November 23, 2012 by ralphstacey.